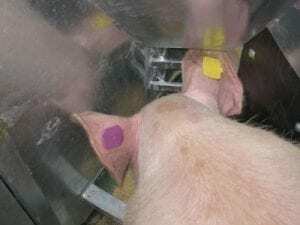 What are RFID Livestock Tags? Radio Frequency Identification (RFID) tags are electronic devices, stamped with a unique number, that identify livestock animals. Depending on the model of RFID Livestock tag, the ID number can be read by an electronic reading device. They are tamper-proof and the electronic chip is sealed within a rigid, durable plastic case, usually shaped like a disc, strip or flag. How are RFID Livestock Tags Used? 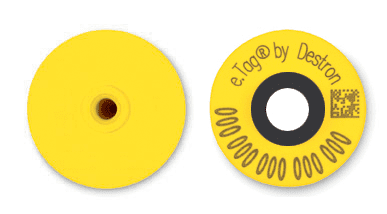 The two discs that make up the tag are attached to the animal’s ear using a simple applicator tool that joins them together through the ear. The process is similar to piercing a human ear with an earring. A 15-digit number is assigned and read using radio frequency technology. When using a reader, livestock can be identified immediately. Why are RFID Tags Necessary for Maximizing Efficiency in Livestock Management? Tagging livestock gives farmers the advantage of quickly identifying their animals during inventory. Visual tags have been used to identify livestock for decades. However, there are disadvantages to this technique. They are easily snagged and lost, and reading a visual tag, tattoo or brand requires each animal to remain still. The visual tag process is time-consuming and leaves plenty of room for error. On the other hand, RFID Livestock tags are designed to last with the maximum ability to remain in place, attached to the animal’s ear. Using a handheld reader, livestock can be scanned while in the chute, during feeding, or on the move. RFID tags can also store medical history. Veterinarians can scan tags during a visit to efficiently obtain vital health information. Osborne offers advanced RFID tracking solutions with easy to use e.Tags® and the highly accurate Osborne ID Logger™. Read more about these products or contact us to learn more.